From an early age, Idalis Valaszquez was passionate about physical fitness. She grew up competing in track and field on Puerto Rico’s national team. However, after becoming a mother, she experienced life threatening complications which made fitness and wellness not just a career, but a matter of survival. After learning how to be fit and to be well, Idalis turned her passion into her profession. Now, she helps thousands of people on a daily basis reach their goals, through her IV Fitness platform, promoting smart training, a healthy body image and teaching positive, sustainable lifestyle changes. I had the privilege to work with Idalis, for Stiry and iFit, as Director of Photography, in telling Idalis’ amazing story of wellness and fitness through sustainable, positive lifestyle changes. Idalis Valazquez goes for a morning run. This was the stormiest week on Maui this year. I intended to fly my drone and get those iconic tropical Hawaiian shots. It rained every day. I flew in between the storms. I dodged the rain drops. I got what I got. I’d do it again. Even a bad day on Maui is still a good day. The red rocks and blue skies of Southern Utah provide striking scenes for aerial cinematography. It was late afternoon when I was finally able to open my drone case and get some shots. I felt like I needed to hurry because there was so much beauty and so little time to fly. I barely scratched the surface, so to speak. The good news is, there is much to see and capture next time I go back. The Bonneville Salt Flats landscape has a stark beauty. The salt preserves and corrupts. Very little can live in the salt. This far from civilization it may as well be another planet. Yet, the solitude, the harshness and the contrasts are inspiring. I would go back. I will go back. I will fly over the salt and the water. Next time, I will stay longer. I shot this drone footage with my DJI Phantom 4 drone. I also did the music. I thought it would be easy, flying a drone. And, in truth, the technology makes it much easier than it could be. Nevertheless, it is still easy to crash. Believe me, I’ve done it. Fortunately not yet catastrophically. Standing in a high mountain meadow, I take off. My phantom 4 rises effortlessly and hovers. In truth, every time I take off I have this feeling that I’m going to loose it, my drone that is. It is going to fly away, or, get blown away, or, run into something, or…I can go on thinking of all the possible ways I might loose or crash my drone. Nevertheless, the good pictures and the great footage do not reside near where I stand. If they did, I wouldn’t need a drone. So, I send my phantom 4 off into the sky. Having passed my Federal Aviation Administration part 107 test and received my FAA UAS certified remote pilot rating, I know that I must fly VLS, visual line of sight. The specs on my phantom say that it has a 3.1 mile range. I, on the other hand, can not see my drone once it has gone about a half mile. I probably need glasses. However, I’m trying to find a balance between VLS and reasonable range. I haven’t found it yet. I fly over the aspen trees toward Mount Timpanogos. The sun is setting and with fall approaching, the colors and the imagery are amazing. I’m trying to get the right exposure, watch the drone and watch the screen when I get a message telling me that the signal is weak. My phantom is not that far away. Then the message changes–signal lost. My drone is out there flying, by itself? And, I must admit, I can’t see it. It has gone out of my sight behind a stand of Aspen trees. That knot in the pit of my stomach tightens. The specs say that the phantom 4 is supposed to return to home upon signal loss. I can’t hear it and I can’t see it. I start walking uphill through the meadow. If I can just get to a higher vantage point. I hold my controller over my head. The signal returns. My drone is found. Hallelujah. The battery life is running critically low so I bring it in for a landing. The sun drops behind the mountain and I pack up my gear. When I look at the footage, I’m amazed. It actually looks pretty good. Nevertheless, you be the judge. 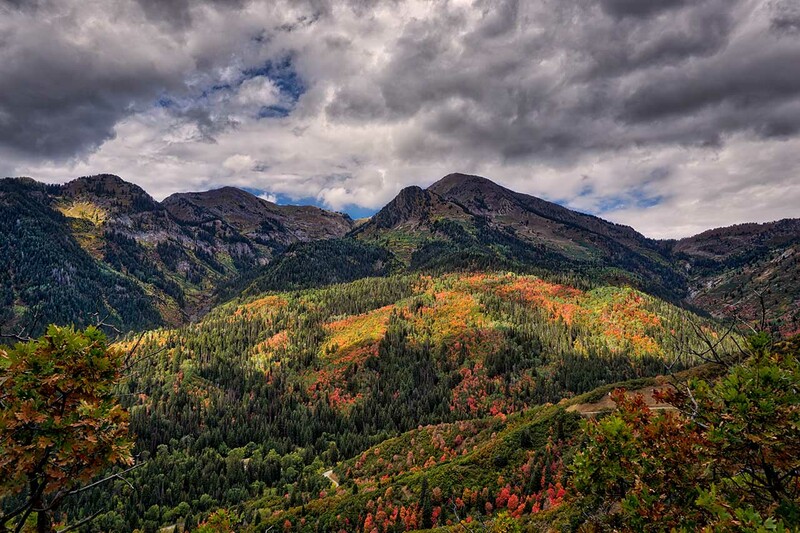 Fall comes to the high mountains above American Fork Canyon in the Uinta National Forest. These mountains are amazing. I never tire of the view from my house. Now that I fly drones, I try to spend as much time as possible soaring over them, remotely. These are a few shots from this summer of the mountains nearest my home. I will post more aerial cinematography shots on a regular basis. Your comments are always welcome.